If you were attracted to this page because of the caption then, we would like to say thanks to those people on Facebook who have shared the contents below: The contents purported to be an interview and confession of a former Ghanaian prophet by name Prophet Elisha aka Spiritual Bulldozer took place on Sankofa radio. There are three things that every human being has a greed for, except vegetarians or people sick of diabetes: The three things are in local Ghanaian Akan vocabulary .... “nam”, “esikyire” and “sika” viz meat/fish ; sugar and money, according to Opanyin Wofa Kissi , a known expert on natural and supernatural healing ( Adom FM Asumasem). Man's greed for money is making a lot of people ( mostly young men in their 20s to 40s), most of them also fake ones, to use the name of God to amass wealth. But should people throw dust into the eyes of distress people just to make money? [next] DISCLAIMER: Please note that by re-publishing the contents below, it does not mean our endorsement; Our goal is to simply to educate people, create the awareness about the contents to help readers make their own inferences from it, pay particular attention, do personal investigations and take the next step. ( MOMA MO ENI NDA HO). PGM. The above named prophet has named certain prophets during an interview with Sankofa Radio as false prophets, who are using the Name of Jesus in vain to deceive people. He said these prophets are actually not from God, but are being used by the devil to deceive the congregation. Former Prophet Elisha said, he himself used to be part of this organization. He said they were using a demonic power called MAHANTA. He said, he rose to be a a leader and a prefect among them. He said he is concerned about the poor congregation, who are being deceived by these prophets, who have already sold their consciences to the devil. He said he is coming out at this time to reveal the truth so that the poor congregation will learn this and save their souls. He advised that every congregant before he/ she becomes part of a church should research and pray about the pastor first, else he/she will end up in the wrong place. Before he began mentioning the names, he admonished the congregants to consider carefully the WORD the LORD Jesus spoke: #Scripture1:  “Watch out that no one deceives you. For many will come in my name, claiming, 'I am the Messiah,' and will deceive many (Matthew 24:4-5). #Scripture2:  and many false prophets will appear and deceive many people (Matthew 24:11). #Scripture3:  For false messiahs and false prophets will appear and perform great signs and wonders to deceive, if possible, even the elect. See, I have told you ahead of time (Matthew 24:24-25). 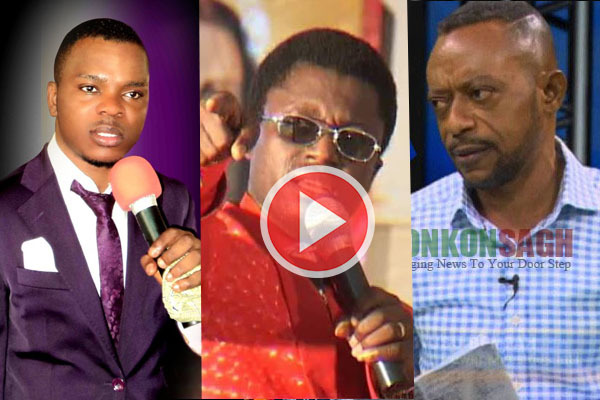 [next] Here are some of the alleged pastors and the Prophets he named as false who were using the power of MAHANTA, and using the name of the LORD Jesus as a cover up. 17. Prophet Angel Uebert - Spirit Embassy, Zimbabwe. 19. Prophet T.B. Joshua - Nigeria.